Why do NASA launch times depend on lighting conditions? It’s all about the solar beta angle. Before sending a shuttle aloft, mission planners carefully calculate the angle defined by its orbital plane around Earth and a line drawn from the center of Earth to the center of the sun. This “solar beta angle” changes constantly as Earth moves around the sun and the shuttle’s orbital plane precesses, or slowly shifts, due to the gravitational tug from Earth’s equatorial bulge. When the beta angle is less than 60 degrees, the shuttle spends a tolerable amount of time in sunlight; the vehicle heats up, but not too much, on the day side of its orbit, then cools off on the night side. When the beta angle is greater than 60 degrees, however, the shuttle must do slow barrel rolls to keep the sun from overheating one side. This “barbeque” mode also was used on the Apollo missions to the moon. Without it, propellant tanks on the sun side of the lunar spacecraft might have exploded. When the shuttle is docked to the space station, it obviously can’t turn barrel rolls. So for the duration of these two-week visits, the station itself has to have a solar beta angle of less than 60 degrees. This month, as it happened, the station’s beta angle exceeded 60 degrees from July 3 to 13, 2009. That meant Endeavour was grounded until July 11 (the shuttle reaches the station on Day 3 after launch). If the shuttle didn’t have to dock with the station, none of this would matter. It would launch whenever NASA wanted, and go into barbeque mode if the solar beta angle became too great. Luckily, high-beta periods occur only a few times a year, near the winter and summer solstices. 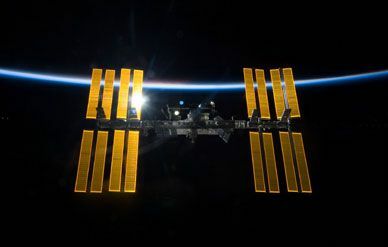 The space station has its own lighting constraints, and at certain times of the year, it ends up in constant sunshine. During these periods, station managers have to keep the crew modules and other parts of the station from overheating while at the same time making sure the solar panels gather enough energy to keep the lights on. The station’s orbit, which is inclined 51.6 degrees from the equator, makes paper-and-pencil calculations tricky, so NASA planners use computer-generated tables of beta angles to determine “cut-outs” (prohibited periods) when setting launch dates and times. The solar beta angle depends heavily on the time of day the shuttle is launched. If, to take a hypothetical case, it goes into polar orbit at noon Florida time, its initial orbit would be oriented edge-on to the sun, for a solar beta angle near zero degrees. This would maximize the amount of time spent in Earth’s shadow—about 37 minutes of each 90-minute orbit. But if the shuttle were to go into polar orbit just as the sun rose or set on either the spring or fall equinox—when the equator lies in the plane of Earth’s orbit around the sun—its orbital path would form a halo facing the sun, with the shuttle in constant sunlight for the first few days. In this case, the beta angle would be close to 90 degrees. The lighting conditions of a shuttle mission can dramatically change the experience for astronauts. Four-time shuttle flier Tom Jones says that some shuttle crews have launched at sunrise in December near the winter solstice. When that launch time is combined with a high inclination of 57 degrees, the shuttle basically follows the line around the planet where night meets day, called the terminator. During their first day in orbit, says Jones, astronauts on such flights “are going round and round in nearly constant, low-angle sunlight. Twilight, if you will. They never see the ground below lit by an overhead sun, and they don’t get to see spectacular sunsets or a fully dark night sky.” The crew has to wait a week or more, until the orbit precesses around the planet, before they see something like a normal day-night cycle. “Some early shuttle missions weren’t that long in duration,” says Jones, “so all they got was a twilight view of the Earth. Bummer!